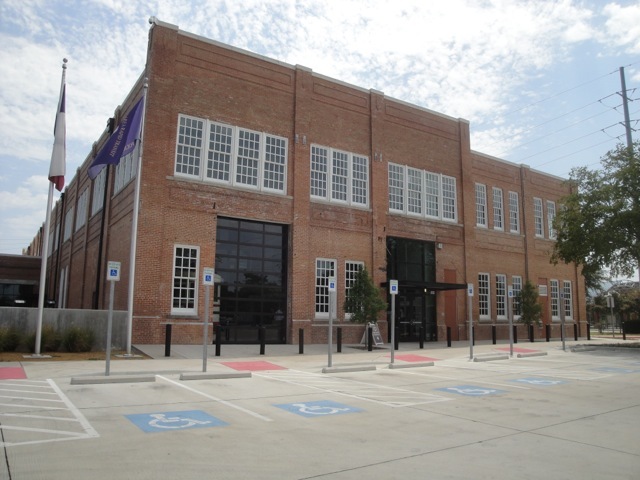 Along Dallas Area Rapid Transit’s Blue Line stands a dignified industrial building, one remnant of a rail network that connected communities across North Texas and helped Dallas become a regional leader for business. Nearly 100 years after its construction, the Monroe Shops serve a new purpose still related to the very infrastructure it once supported. Preservation Dallas recently offered a behind-the-scenes look at the building’s history and 21st Century transformation into the DART Police Headquarters. The north exterior of the Monroe Shops shows original service doors where interurban vehicles once entered. In the early years of the 20th Century, rail was the quickest and most profitable means of transportation in North Texas. Steam rail lines connected Dallas to cities across the country, while street railways connected new neighborhoods within the city limits. But neither of these provided reliable connections to the rapidly-industrializing, scattered communities in the region. Instead, a new form of electric railway — the interurban — began linking rural areas to urban centers. 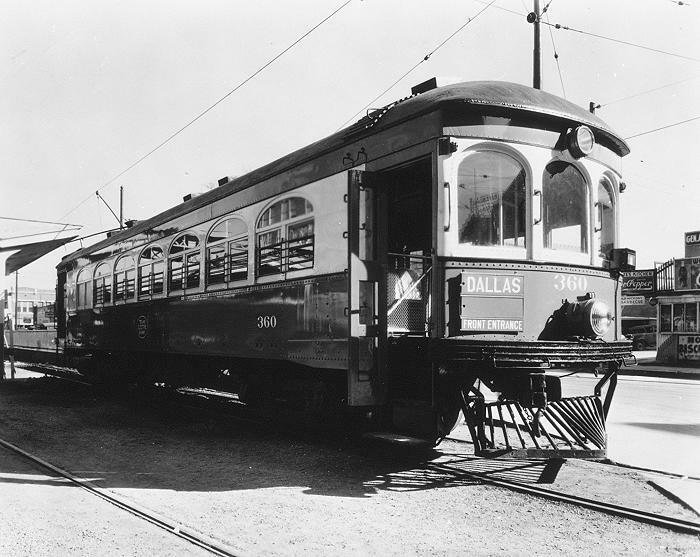 Interurban lines expanded outward from Dallas to connect communities across North Texas. 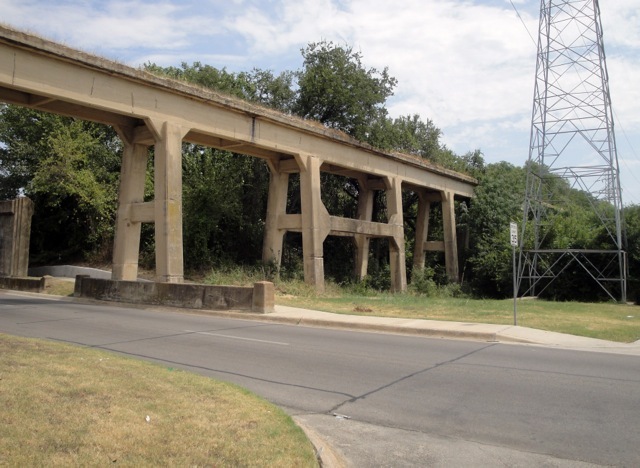 Remnants of abandoned infrastructure still remain in places, such as this viaduct crossing Clarendon Drive in Dallas. The first electric interurban railway in Texas opened in 1901 and connected Sherman to Dennison. Shortly after, a line between Fort Worth and Dallas opened for service. Over the next 20 years interurban lines stretched in every direction from Dallas, connecting the city to Denison, Fort Worth/Cleburne, Waco, Corsicana, Denton and Terrell. Owned and operated by various private companies, fast and frequent service moved passengers, freight and mail to dozens of cities and created the region’s first commuter rail network. Interurban vehicles — similar to streetcars of the era and powered by overhead electric wires — were flexible enough to travel on dedicated right-of-way in open countryside and streetcar tracks within cities. The Texas Electric Company’s interurban vehicles were fast, comfortable and offered reliable service across North Texas. Looking to reach communities south of Dallas, in 1913 Southern Traction Company opened both a Dallas-Corsicana and Dallas-Waco interurban line. The need for a new, convenient maintenance facility led the company to build at Trinity Heights — four miles south of Dallas where the two lines met. This new facility would also serve vehicles for Texas Traction Company, the Dallas-Denison line also controlled by the Strickland-Goodwin Management Association. A few years later (in 1917) these two companies would merge operations and become known as the Texas Electric Railway. 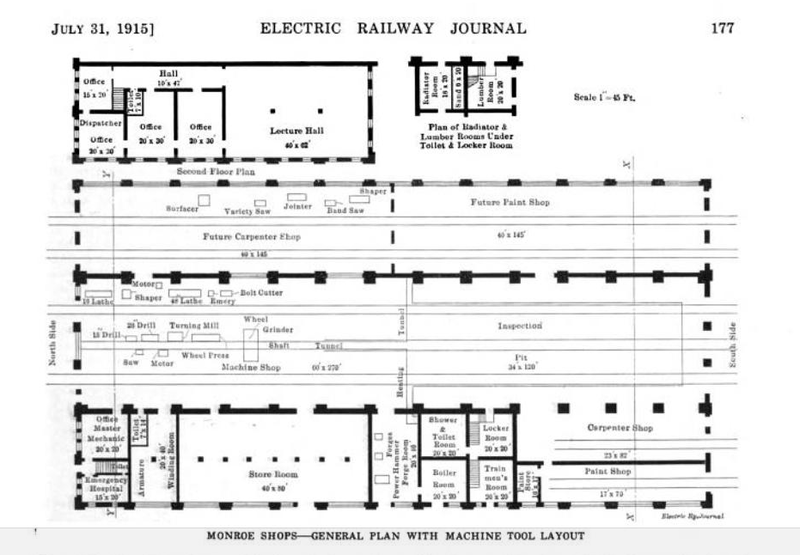 Original plans for the Monroe Shops were detailed in a 1915 article in the Electric Railway Journal. 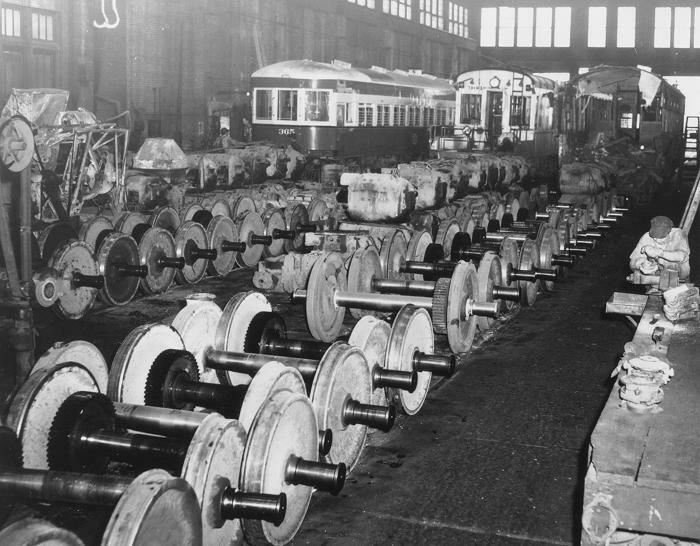 The Monroe Shops opened in 1914 and quickly became the home to all heavy repair work for the interurban vehicles. The 275-foot long red brick building featured a main bay with three tracks running the length of the building. Along this bay was the inspection pit area and machine shop with tools for turning and repairing axels. A large 15-ton box crane spanned the bay and ran along rails 21 feet above the floor, moving vehicles and equipment where needed. The maintenance bay and machine shop are shown in this photo of the Monroe Shops. A two-story west wing ran the length of the building. The upper level contained general offices, a lecture hall and a dispatchers office with a view over the main tracks; a blacksmith shop, carpenter shop and paint shop were located on the lower level. In a later phase, the paint shop was expanded in a new room on the east side of the building (but an expanded carpenter shop was never constructed). A set of large rails (still visible) ran along the sides of the maintenance bay to support a 15-ton box crane. The largest interurban operator in North Texas, the Texas Electric Railway had 250 rail cars operating over 226 miles of track. Passenger service originated from the 1916 Interurban Building in downtown Dallas and freight service (initiated in 1928 to offset passenger declines) from a depot near Ferris Plaza. The Depression and growth in automobile ownership took a toll on the interurban lines, and by 1942 Texas Electric was the last independent interurban line in Texas. A major accident involving two passenger vehicles in 1948 sealed its fate: due to the high cost of safety upgrades for the system, passenger service ended on December 31st (freight service only lasted a little longer). Texas Electric Bus Line continued servicing destinations, but the interurban vehicles were sold and the Monroe Shops closed. The interurban era in North Texas had ended. 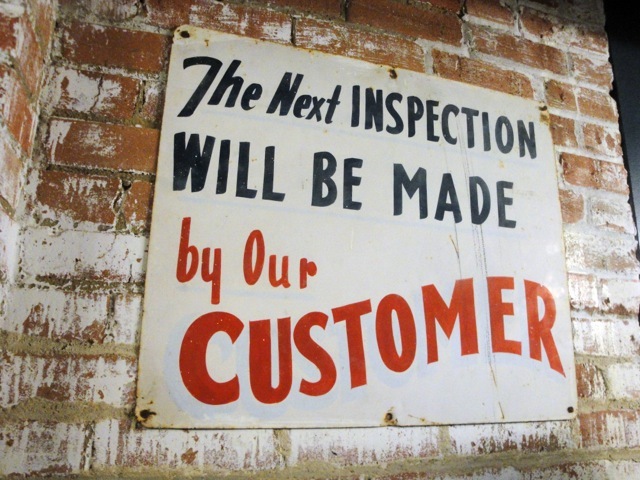 An original sign still hangs on a wall in the Monroe Shops. The Monroe Shops passed into new ownership, home to Fleming & Son Papermill, U-Haul Company and the City of Dallas before becoming vacant. Dallas Area Rapid Transit (DART) acquired the abandoned and crumbling building in April 1991 as part of the land acquisition for its Blue Line; it was listed in the National Register of Historic Places in 2007. After several unsuccessful attempts to redevelop the property for retail adjacent to DART’s Illinois Station the decision was made to use the building for a new DART Police Headquarters. 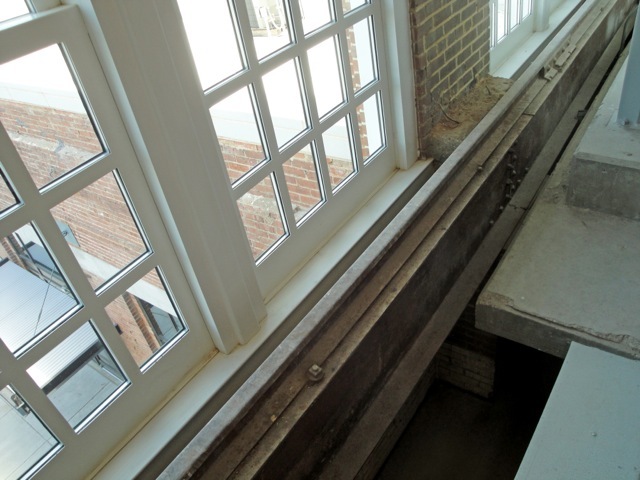 To protect the historic building, a new facility was built within the old walls as seen in this DART construction photo. Repurposing of the historic building was a challenge, but the solution designed a new building within the shell of the original building. Exterior walls were repaired, the rotting roof was reinforced and original architectural features were restored and highlighted in green paint. Where once an expansive service aisle was located, three floors of modern workspace, meeting rooms and staff offices were erected. 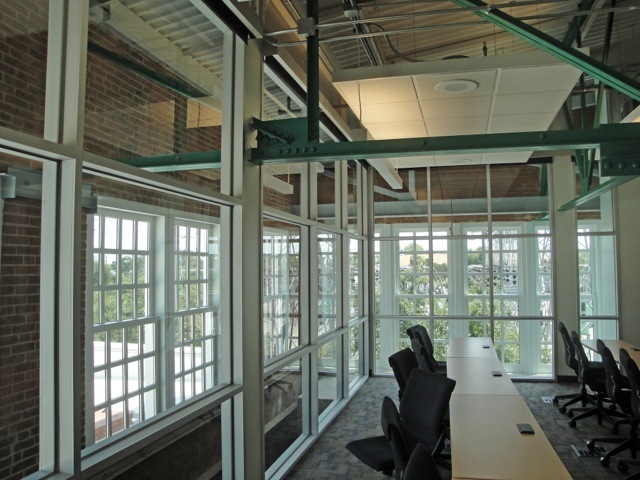 The paint shop became the new fitness room, and offices overlook rail lines once watched by interurban dispatchers. A new training room sits nestled inside the old walls; the space between windows doubles as an insulator from heat and cold. The $20 million facility opened in 2011, consolidating many of the DART police functions under one roof and creating a more efficient work experience in an environmentally friendly building. 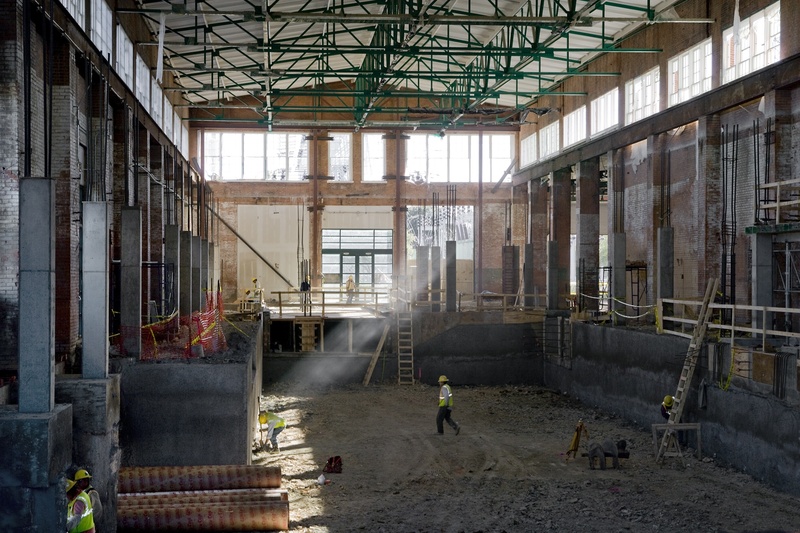 As the first publicly owned building listed on the National Register of Historic Places to achieve the LEED Platinum Certification, construction waste was diverted from landfills, power and water consumption was reduced with appropriate systems, and recycled materials were used in its construction. With the building’s proximity to a rail station, DART police personell have easy access to over 90 miles of rail. 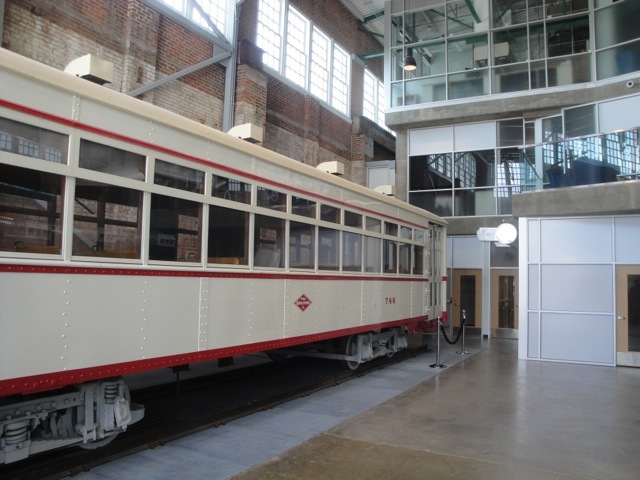 Inside the building’s lobby, a restored Dallas Railway & Terminal streetcar (acquired by DART for a transit museum that never materialized) sits on display near where interurban cars would have undergone maintenance nearly 100 years ago. DART’s expanding rail lines follow some of the same paths the interurban lines traveled nearly a century ago. And along those historic routes, remnants have been preserved for future generations while others crumble away. Today, the Plano Interurban Railway Museum showcases the city’s Texas Electric Railway interurban depot and a restored vehicle; a vehicle from Texas Electric is also on display in Corsicana. Other displays include historic rail cars in Fort Worth and Cleburne — restored to the way they appeared while serving other regional interurban lines. The purpose of the Monroe Shops has evolved from one of rail vehicle maintenance to rail passenger protection. As North Texas looks to the future and reconnects communities with reliable passenger rail service we are reminded of how the interurban shaped the region’s growth 100 years ago, and how infrastructure once cast aside can be transformed into something greater. 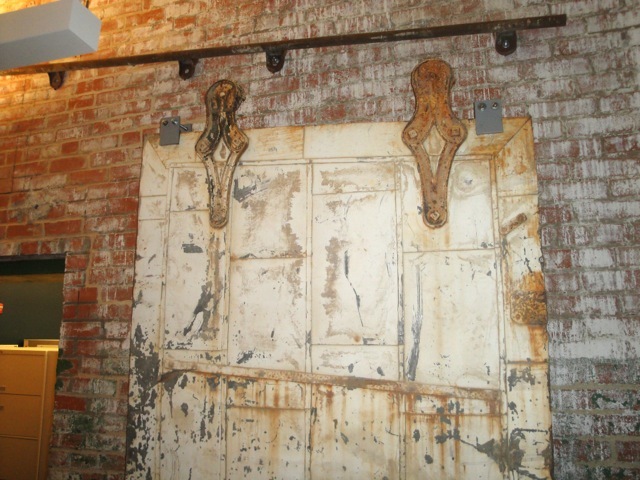 Some of the original fire doors have been restored and hung in appropriate locations throughout the building. 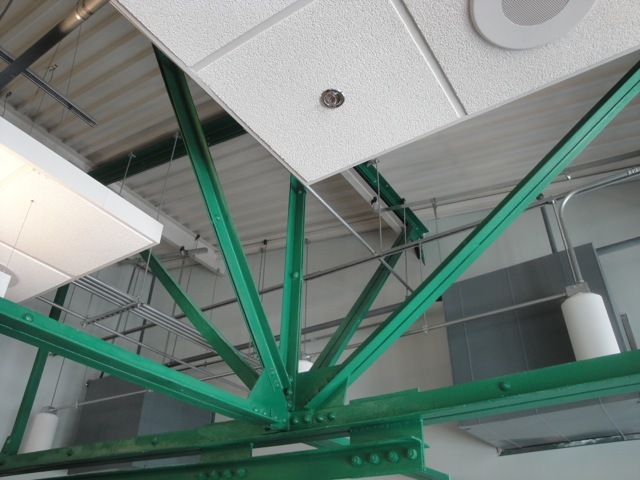 The original roof truss serves partly as sculpture in one of the conference rooms. Original structural elements have been painted a vibrant (historically appropriate) green to distinguish the old from the new. 8 Responses to "Monroe Shops and the Interurban"
Careful on that “largest west of the Mississippi River” comment. Only true if you add, “except California”. I believe Pacific Electric had close to 1000 miles at some point. Thanks. I guess that would make it the “largest between the Mississippi and California”. A little confusing so I edited my original post; it was definitely the largest interurban system in Texas. I rode the interurban as a child back in the late 1930’s. Of course i was so young i just barely remember it. We went from Oak Cliff to Waco. We called Clarendon roller coaster road when i was a teen. I guess that old interurban tressel is still there? What a great article…and an historically appropriate way to preserve this building and its history…bravo!